The Durham Bulls opened up a ten game lead in the division by going 5-2 on the week. The Bulls are now 54-34 on the year and are in possession of the best record in the league. A lot going on this week with the AAA All-Star Game on July 14 and the Futures Game on July 12. Jeremy Hellickson and Desmond Jennings will join Biscuits Alex Torres in the All-Star Futures Game on July 11. Joe Dillon. Dan Johnson and Elliott Johnson and were named to the all-star game with Dan Johnson participating in the home run derby. Both games will be covered live, the Futures Game on ESPN2 and the AAA All-Star Game on MLB Network. Transactions: Omar Luna placed on temporary inactive list (7/5/10). Elliot Johnson activated from disabled list (7/5/10). Dale Thayer activated from disabled list (7/5/10). Aneury Rodriguez transferred to Hudson Valley (7/5/10). The Week Ahead: 7/10/10-7/11/10: at Norfolk Tides (41-49). 7/12/10-7/14/10: All-Star Break. 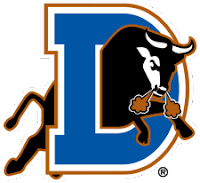 7/15/10-7/16/10: vs Charlotte Knights (45-45).